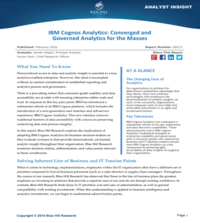 Common thought in analytics is that consumer-grade usability and enterprise-caliber scale and governance are at odds. This white paper looks at how a next-generation interface and self-service experience removes those traditional barriers. The democratizing of data and analytic insights is allowing organizations to achieve competitive advantage. But to be successful, organizations must turn data into actionable information in an agile, on-demand fashion. Common thinking around data and analytics is that consumer-grade usability and enterprise-caliber scale and governance are at odds. Download this insightful report to learn how a next-generation interface and self-service experience removes those traditional barriers and the considerations you must make to provide democratized, but trusted, analytic insights.